It’s that time of year again—time to pack up the school lunches. In the daily grind, even the most creative of cooks can hit a culinary road block. One way to avoid the lunch rut is to put your kids in charge of making their own midday meals. If they’ve had a hand in the prep work, they may be more likely to eat it (vs. trading or tossing). 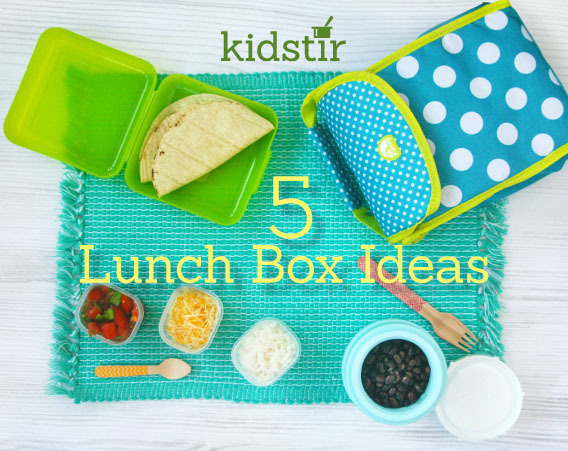 Here are 5 tips for thinking out of the lunch box. Help your kids pack up taco toppings in separate containers and let them build their own tacos at lunch. Warm leftover taco filling (beans, beef, shredded chicken) and pack it in a Thermos. Then pack individual containers with grated cheese, salsa, lettuce, rice, and tortillas or taco shells. At school, they can set up a taco bar in the cafeteria! To prevent those soggy sandwiches, pack up the fixings for a sub and let you kids assemble it at school. Include fillings such as lettuce, olives, tomatoes, and deli meats, along with a small container of mayo or olive oil and a fresh baguette or sub roll. Send chicken or turkey salad (made with Greek yogurt instead of mayo for a healthy alternative) in a container along with a wapped up piece of pita bread. At school, the kids can stuff their pockets (or choose to eat them separately with a fork). kebabs in the lunch room. Layer a mason jar with salad stuff. Start with dressing on the bottom of the jar. Then add layers of lettuce, grated carrot, chick peas or diced meats, and tomatoes. At school, kids can shake it up and eat it right out of the jar.